From the Grapevine. The Relationship between the Gabon Disaster and PF Violence. A number of people have been wondering why there has been alot of lawlessness from the time the Patriotic Front government came into power. Others have argued that it is because PF has alot of supporters who are illiterate therefore do not understand the importance of the rule of law or respect for human rights. However, there is a news School of thought that is very interesting and we have to share it. Some people say the lawlessness in PF is due to the tragic Gabon Air Disaster in which the entire Zambia National Soccer Team, coaching staff and Journalist perished. They say when the tragic accident happened, Late President Fredrick Chiluba sent buses around the country to ferry mourners to Lusaka for the National funeral. It is believed that a number of Street Kids especially from the Copperbelt took advantage of the free transport and found themselves in Lusaka. Off course there was free food so they did not worry about food for the entire national mourning period. Trouble however started after the burial of the departed national team. There was no longer free food and transport. These street kids had to fend for themselves in Lusaka. No one was concerned about their welfare including government that facilitated for them to get to Lusaka. 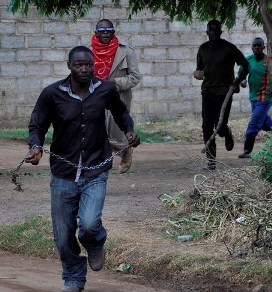 Most of them resorted to criminal activities including attacking people from Flyover bridges in Lusaka. Others were found at City Market, Katondo Street and Comesa Market among many places. FORMATION OF PF. When Michael Sata formed the Patriotic Front, many hypothetically right thinking members of society hesitated to join the PF. The easiest catch was these stranded street kids who had now become adults. They joined PF with the survival of the fittest mentality from the Streets. These are the Kaizer Zulu, Kennedy Kamba and Stephen Kampyongo of today. Kaizer used to unblock stolen Cellphones on Katondo Street, Kennedy Kamba used to sell imported beer on behalf of cross border traders at Comesa Market. Stephen Kampyongo used to be a Call boy at City market and also sold merchandise on behalf of others. These people have now tasted money and power. Look at the wealth Kaizer has accumulated. He has money all over including fat bank accounts in Dubai. Look at the double story houses Kamba has built around Lusaka. Same with Kampyongo. These people will do everything to hang on to power including killing. That is why Kampyongo says he is ready to kill to maintain power. They are scared of going back to the streets. They do not only need several overnight prayers from Pukuta Mwanza, Joshua Banda or that another businessman called Peter Ndhlovu of Bigoca. They need psycatrists. They smoked too much weed, sniffed too much Glue(Gencem) and robbed alot of people on the streets. They are ready for anything. You can not take away the street life out of them easily. They need serious counselling. Ask Chishimba Kambwili. He knows them.